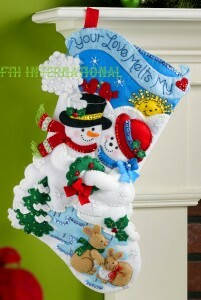 Your Love Melts My Heart 18" Bucilla Felt Christmas Stocking Kit #86552 - FTH International Sales Ltd. This is just one of four new kits being released for Winter 2014. Please check my listings to see the other new kits. 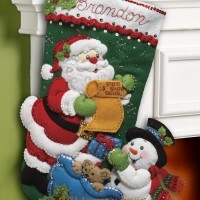 This adorable stocking kit really will Melt Your Heart when you have completed it. 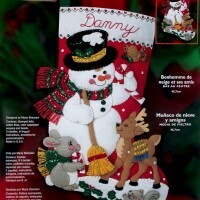 This stocking design features Frosty and his Snow Lady sharing a precious snuggle on a frozen pond while a pair of red birds on Frosty’s hat and a pair of bunny rabbits at their feet appear to be sharing special moments of their own.